This year we are celebrating our 25th Anniversary as a non-profit corporate entity. Recently, at our commemorative conference, we heard various speakers address the progression of our activities and accomplishments during those twenty-five years. At the heart of this has been the constant dream of bringing together the genuine clans and historic Irish families in a communal way; integrated with contemporary Irish society and attitudes. Clans of Ireland authenticates and promotes the interests of Irish clans and historic families. It is also a major focus for Clans of Ireland to reach out to Irish people throughout the World and deliver to them an intrinsic understanding of their traditions and history, so that they can appreciate our authentic culture. We recognise that opinions of Irish ex-pats are influenced by different motivations and insights to those expressed at home in Ireland. A fierce fervency frequently symbolises such sentiments which come from abroad, thus encouraging our less impassioned indigenous enthusiasm. This patriotic nostalgia supports dedicated native scholarship. Clans of Ireland, through its structure, promotes inclusivity amongst all of the Irish at home or abroad through its member organisations by disseminating academic study, by fostering organisational development, by legitimising, through membership criteria, those clans who display a valid non-commercial interest in Irish heritage and, arguably most importantly, by encouraging social connection around the World. The Ó hUigín Clan are recognised as descendants of the Southern Ui Neill and were considered as hereditary poets to the courts of Gaelic Ireland. 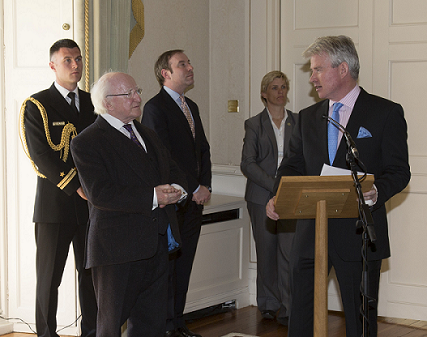 Thus, President Higgins, you are entirely genetically consistent, as you are recognised as an accomplished poet. You are also renowned for your enduring private and societal dedication to Irish culture, in addition to having an academic curiosity in migration among your many interests. Clans of Ireland supports the fundamental principles of uniting peoples of the same blood and family association through marriage or other family bonds. It is my hope that Clans of Ireland, with your continuing patronage, will continue to foster even greater links between the Irish at home and the diaspora. But for your patronage, President Higgins, Clans of Ireland would be less consequential. Finally, if you will permit me a personal indulgence, as I would like to share the fact with our audience that there has been a multi-generational friendship between your family of Ballycar and my mother’s Keogh family of Newmarket-on-Fergus. Ladies and gentlemen, it may come as a surprise to you to learn that my maternal grandfather Denis Keogh died at President Higgins’ family home at Ballycar. I would now like to present you, President Higgins, on behalf of Clans of Ireland, with your personal family tree of the Higgins Family of Ballycar, County Clare; dedicated to you as President of Ireland and Patron of Clans of Ireland.